This article is about the phenomenon of general relativity. For the movement of classical fluids, see Gravity wave. Simulation showing gravitational waves produced during the final moments before the collision of two black holes. In the video, the waves could be seen to propagate outwards as the black holes spin past each other. Gravitational waves are ripples in the curvature of spacetime that propagate as waves at the speed of light, generated in certain gravitational interactions that propagate outward from their source. The possibility of gravitational waves was discussed in 1893 by Oliver Heaviside using the analogy between the inverse-square law in gravitation and electricity. In 1905 Henri Poincaré first proposed gravitational waves (ondes gravifiques) emanating from a body and propagating at the speed of light as being required by the Lorentz transformations. Predicted in 1916 by Albert Einstein on the basis of his theory of general relativity, gravitational waves transport energy as gravitational radiation, a form of radiant energy similar to electromagnetic radiation. Gravitational waves cannot exist in the Newton's law of universal gravitation, since it is predicated on the assumption that physical interactions propagate at infinite speed. Various gravitational-wave observatories (detectors) are under construction or in operation, such as Advanced LIGO which began observations in September 2015. Potential sources of detectable gravitational waves include binary star systems composed of white dwarfs, neutron stars, and black holes. On February 11, 2016, the LIGO Scientific Collaboration and Virgo Collaboration teams announced that they had made the first observation of gravitational waves, originating from a pair of merging black holes using the Advanced LIGO detectors. On June 15, 2016, a second detection of gravitational waves from coalescing black holes was announced. In Einstein's theory of general relativity, gravity is treated as a phenomenon resulting from the curvature of spacetime. This curvature is caused by the presence of mass. Generally, the more mass that is contained within a given volume of space, the greater the curvature of spacetime will be at the boundary of its volume. As objects with mass move around in spacetime, the curvature changes to reflect the changed locations of those objects. In certain circumstances, accelerating objects generate changes in this curvature, which propagate outwards at the speed of light in a wave-like manner. These propagating phenomena are known as gravitational waves. As a gravitational wave passes an observer, that observer will find spacetime distorted by the effects of strain. Distances between objects increase and decrease rhythmically as the wave passes, at a frequency corresponding to that of the wave. This occurs despite such free objects never being subjected to an unbalanced force. The magnitude of this effect decreases proportional to the inverse distance from the source. Inspiraling binary neutron stars are predicted to be a powerful source of gravitational waves as they coalesce, due to the very large acceleration of their masses as they orbit close to one another. However, due to the astronomical distances to these sources, the effects when measured on Earth are predicted to be very small, having strains of less than 1 part in 1020. Scientists have demonstrated the existence of these waves with ever more sensitive detectors. The most sensitive detector accomplished the task possessing a sensitivity measurement of about one part in 7022499999999999999♠5×1022 (as of 2012) provided by the LIGO and VIRGO observatories. A space based observatory, the Laser Interferometer Space Antenna, is currently under development by ESA. Gravitational waves can penetrate regions of space that electromagnetic waves cannot. They are able to allow the observation of the merger of black holes and possibly other exotic objects in the distant Universe. Such systems cannot be observed with more traditional means such as optical telescopes or radio telescopes, and so gravitational-wave astronomy gives new insights into the working of the Universe. In particular, gravitational waves could be of interest to cosmologists as they offer a possible way of observing the very early Universe. This is not possible with conventional astronomy, since before recombination the Universe was opaque to electromagnetic radiation. Precise measurements of gravitational waves will also allow scientists to test more thoroughly the general theory of relativity. In 1905, Henri Poincaré first suggested that in analogy to an accelerating electrical charge producing electromagnetic waves, accelerated masses in a relativistic field theory of gravity should produce gravitational waves. When Einstein published his theory of general relativity in 1915, he was skeptical of Poincaré's idea since the theory implied there were no "gravitational dipoles". Nonetheless, he still pursued the idea and based on various approximations came to the conclusion there must, in fact, be three types of gravitational wave (dubbed longitudinal-longitudinal, transverse-longitudinal, and transverse-transverse by Hermann Weyl). However, the nature of Einstein's approximations led many (including Einstein himself) to doubt the result. In 1922, Arthur Eddington showed that two of Einstein's types of waves were artifacts of the coordinate system he used, and could be made to propagate at any speed by choosing appropriate coordinates, leading Eddington to jest that they "propagate at the speed of thought". This also cast doubt on the physicality of the third (transverse-transverse) type (which Eddington showed always propagate at the speed of light regardless of coordinate system). In 1936, Einstein and Nathan Rosen submitted a paper to Physical Review in which they claimed gravitational waves could not exist in the full theory of general relativity because any such solution of the field equations would have a singularity. The journal sent their manuscript to be reviewed by Howard P. Robertson, who (anonymously) reported that the singularities in question were simply the harmless coordinate singularities of the employed cylindrical coordinates. Einstein, who was unfamiliar with the concept of peer review, angrily withdrew the manuscript, never to publish in Physical Review again. Nonetheless, his assistant Leopold Infeld, who had been in contact with Robertson, convinced Einstein that the criticism was correct and the paper was rewritten with the opposite conclusion (and published elsewhere). In 1956, Felix Pirani remedied the confusion caused by the use of various coordinate systems by rephrasing the gravitational waves in terms of the manifestly observable Riemann curvature tensor. At the time this work was mostly ignored because the community was focused on a different question: whether gravitational waves could transmit energy. This matter was settled by a thought experiment proposed by Richard Feynman during the first "GR" conference at Chapel Hill in 1957. In short, his argument (known as the "sticky bead argument") notes that if one takes a stick with beads then the effect of a passing gravitational wave would be to move the beads along the stick; friction would then produce heat, implying that the passing wave had done work. Shortly after, Hermann Bondi (a former gravitational wave skeptic) published a detailed version of the "sticky bead argument". After the Chapel Hill conference, Joseph Weber started designing and building the first gravitational wave detectors now known as Weber bars. In 1969, Weber claimed to have detected the first gravitational waves and by 1970 he was "detecting" signals regularly; however, the frequency of detection soon raised doubts on the validity of his observations as the implied rate of energy loss of the Milky Way would drain our galaxy of energy on a timescale much shorter than its inferred age. These doubts were strengthened when, by the mid-1970s, repeat experiments from other groups building their own Weber bars across the globe failed to find any signals, and by the late 1970s general consensus was that Weber's results were spurious. In the same period, the first indirect evidence for the existence of gravitational waves was discovered. In 1974, Russell Alan Hulse and Joseph Hooton Taylor, Jr. discovered the first binary pulsar (a discovery that earned them the 1993 Nobel Prize in Physics). In 1979, results were published detailing measurement of the gradual decay of the orbital period of the Hulse-Taylor pulsar, which fitted precisely with the loss of energy and angular momentum in gravitational radiation predicted by general relativity. 1962 – M. E. Gertsenshtein and V. I. Pustovoit publish the first paper describing the principles for using interferometers to detect very long wavelength gravitational waves. 1984 – Kip Thorne, Ronald Drever, and Rainer Weiss form a steering committee after the NSF asks MIT and Caltech to join forces to lead a LIGO project. 1994 – LIGO Laboratory Director Barry Barish and his team create the LIGO study, project plan, and budget, receive long-withheld NSF funding, and go-ahead for construction. Barish is appointed Principal Investigator and LIGO, with a budget of US$395 million, becomes the largest overall funded NSF project in history. 1997 – The LIGO Scientific Collaboration (LSC) and the Gravitational Wave International Committee (GWIC) are formed. 2004 – Advanced LIGO upgrade is approved by the National Science Board. 2005 - The binary black hole problem solved: three groups independently developed groundbreaking new methods to model the inspiral, merger, and ring-down of binary black holes. 2014 – Astronomers at the Harvard–Smithsonian Center for Astrophysics erroneously claim that they have detected and produced "the first direct image of gravitational waves" in the cosmic microwave background. 2015 – Advanced LIGO begins operation. −4 M⊙ black hole. The signal is named GW150914. Gravitational waves are constantly passing Earth; however, even the strongest have a minuscule effect and their sources are generally at a great distance. For example, the waves given off by the cataclysmic final merger of GW150914 reached Earth after travelling over a billion lightyears, as a ripple in spacetime that changed the length of a 4-km LIGO arm by a ten thousandth of the width of a proton, proportionally equivalent to changing the distance to the nearest star outside the Solar System by one hair's width. This tiny effect from even extreme gravitational waves makes them undetectable on Earth by any means other than the most sophisticated detectors. The effects of a passing gravitational wave, in an extremely exaggerated form, can be visualized by imagining a perfectly flat region of spacetime with a group of motionless test particles lying in a plane (e.g., the surface of a computer screen). As a gravitational wave passes through the particles along a line perpendicular to the plane of the particles (i.e. 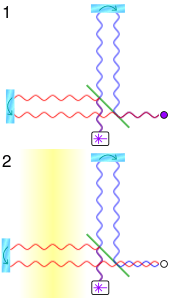 following the observer's line of vision into the screen), the particles will follow the distortion in spacetime, oscillating in a "cruciform" manner, as shown in the animations. The area enclosed by the test particles does not change and there is no motion along the direction of propagation. The oscillations depicted in the animation are exaggerated for the purpose of discussion — in reality a gravitational wave has a very small amplitude (as formulated in linearized gravity). 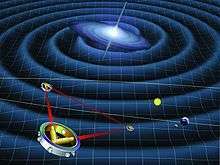 However, they help illustrate the kind of oscillations associated with gravitational waves as produced, for example, by a pair of masses in a circular orbit. In this case the amplitude of the gravitational wave is constant, but its plane of polarization changes or rotates at twice the orbital rate and so the time-varying gravitational wave size (or 'periodic spacetime strain') exhibits a variation as shown in the animation. If the orbit of the masses is elliptical then the gravitational wave's amplitude also varies with time according to Einstein's quadrupole formula. In the above example, it is assumed that the wave is linearly polarized with a "plus" polarization, written h+. Polarization of a gravitational wave is just like polarization of a light wave except that the polarizations of a gravitational wave are at 45 degrees, as opposed to 90 degrees. In particular, in a "cross"-polarized gravitational wave, h×, the effect on the test particles would be basically the same, but rotated by 45 degrees, as shown in the second animation. Just as with light polarization, the polarizations of gravitational waves may also be expressed in terms of circularly polarized waves. Gravitational waves are polarized because of the nature of their sources. More technically, the third time derivative of the quadrupole moment (or the l-th time derivative of the l-th multipole moment) of an isolated system's stress–energy tensor must be non-zero in order for it to emit gravitational radiation. This is analogous to the changing dipole moment of charge or current that is necessary for the emission of electromagnetic radiation. For example, a pair of solar mass neutron stars in a circular orbit at a separation of 1.89×108 m (189,000 km) has an orbital period of 1,000 seconds, and an expected lifetime of 1.30×1013 seconds or about 414,000 years. Such a system could be observed by LISA if it were not too far away. A far greater number of white dwarf binaries exist with orbital periods in this range. White dwarf binaries have masses in the order of the Sun, and diameters in the order of the Earth. They cannot get much closer together than 10,000 km before they will merge and explode in a supernova which would also end the emission of gravitational waves. Until then, their gravitational radiation would be comparable to that of a neutron star binary. When the orbit of a neutron star binary has decayed to 1.89×106 m (1890 km), its remaining lifetime is about 130,000 seconds or 36 hours. The orbital frequency will vary from 1 orbit per second at the start, to 918 orbits per second when the orbit has shrunk to 20 km at merger. The majority of gravitational radiation emitted will be at twice the orbital frequency. Just before merger, the inspiral would be observed by LIGO if such a binary were close enough. LIGO has only a few minutes to observe this merger out of a total orbital lifetime that may have been billions of years. Advanced LIGO detector should be able to detect these events up to 200 megaparsec away. Within this range of the order 40 events are expected per year. A supernova is an astronomical event that occurs during the last stellar evolutionary stages of a massive star's life, whose dramatic and catastrophic destruction is marked by one final titanic explosion. This explosion can happen in one of many ways, but in all of them a significant proportion of the matter in the star is blown away into the surrounding space at extremely high velocities (up to 10% of the speed of light). Unless there is perfect spherical symmetry in these explosions (i.e., unless matter is spewed out evenly in all directions), there will be gravitational radiation from the explosion. This is because gravitational waves are generated by a changing quadrupole moment, which can happen only when there is asymmetrical movement of masses. Since the exact mechanism by which supernovae take place is not fully understood, it is not easy to model the gravitational radiation emitted by them. Many models of the Universe postulate that there was an inflationary epoch in the early history of the Universe when space expanded by a large factor in a very short amount of time. If this expansion was not symmetric in all directions, it may have emitted gravitational radiation detectable today as a gravitational wave background. This background signal is too weak for any currently operational gravitational wave detector to observe, and it is thought it may be decades before such an observation can be made. At present, and unlike all other known forces in the universe, no "force carrying" particle has been identified as mediating gravitational interactions. In the framework of quantum field theory, the graviton is the name given to a hypothetical elementary particle speculated to be the force carrier that mediates gravity. However the graviton is not yet proven to exist and no reconciliation yet exists between general relativity which describes gravity, and the Standard Model which describes all other fundamental forces. (For scientific models which attempt to reconcile these, see quantum gravity). Due to the weakness of the coupling of gravity to matter, gravitational waves experience very little absorption or scattering, even as they travel over astronomical distances. In particular, gravitational waves are expected to be unaffected by the opacity of the very early universe before space became "transparent"; observations based upon light, radio waves, and other electromagnetic radiation further back into time is limited or unavailable. Therefore, gravitational waves are expected to have the potential to open a new means of observation to the very early universe. In the case of GW150914, only two detectors were operating at the time of the event, therefore, the direction is not so precisely defined and it could lie anywhere within an arc-shaped region of space rather than being identified as a single point. During the past century, astronomy has been revolutionized by the use of new methods for observing the universe. Astronomical observations were originally made using visible light. Galileo Galilei pioneered the use of telescopes to enhance these observations. However, visible light is only a small portion of the electromagnetic spectrum, and not all objects in the distant universe shine strongly in this particular band. More useful information may be found, for example, in radio wavelengths. Using radio telescopes, astronomers have found pulsars, quasars, and other extreme objects that push the limits of our understanding of physics. Observations in the microwave band have opened our eyes to the faint imprints of the Big Bang, a discovery Stephen Hawking called the "greatest discovery of the century, if not all time". Similar advances in observations using gamma rays, x-rays, ultraviolet light, and infrared light have also brought new insights to astronomy. As each of these regions of the spectrum has opened, new discoveries have been made that could not have been made otherwise. Astronomers hope that the same holds true of gravitational waves. Gravitational waves have two important and unique properties. First, there is no need for any type of matter to be present nearby in order for the waves to be generated by a binary system of uncharged black holes, which would emit no electromagnetic radiation. Second, gravitational waves can pass through any intervening matter without being scattered significantly. Whereas light from distant stars may be blocked out by interstellar dust, for example, gravitational waves will pass through essentially unimpeded. These two features allow gravitational waves to carry information about astronomical phenomena never before observed by humans. The sources of gravitational waves described above are in the low-frequency end of the gravitational-wave spectrum (10−7 to 105 Hz). An astrophysical source at the high-frequency end of the gravitational-wave spectrum (above 105 Hz and probably 1010 Hz) generates relic gravitational waves that are theorized to be faint imprints of the Big Bang like the cosmic microwave background (see gravitational wave background). At these high frequencies it is potentially possible that the sources may be "man made" that is, gravitational waves generated and detected in the laboratory. The information about the orbit can be used to predict how much energy (and angular momentum) would be radiated in the form of gravitational waves. As the energy is carried off, the stars should draw closer to each other. This effect is called an inspiral, and it can be observed in the pulsar's signals. The measurements on the Hulse–Taylor system have been carried out over more than 30 years. It has been shown that the change in the orbit period, as predicted from the assumed gravitational radiation and general relativity, and the observations matched within 0.2 percent. In 1993, Russell Hulse and Joe Taylor were awarded the Nobel Prize in Physics for this work, which was the first indirect evidence for gravitational waves. The lifetime of this binary system, from the present to merger is estimated to be a few hundred million years. MiniGRAIL is a spherical gravitational wave antenna using this principle. It is based at Leiden University, consisting of an exactingly machined 1150 kg sphere cryogenically cooled to 20 mK. The spherical configuration allows for equal sensitivity in all directions, and is somewhat experimentally simpler than larger linear devices requiring high vacuum. Events are detected by measuring deformation of the detector sphere. MiniGRAIL is highly sensitive in the 2–4 kHz range, suitable for detecting gravitational waves from rotating neutron star instabilities or small black hole mergers. There are currently two detectors focused on the higher end of the gravitational wave spectrum (10−7 to 105 Hz): one at University of Birmingham, England, and the other at INFN Genoa, Italy. A third is under development at Chongqing University, China. The Birmingham detector measures changes in the polarization state of a microwave beam circulating in a closed loop about one meter across. Both detectors are expected to be sensitive to periodic spacetime strains of , given as an amplitude spectral density. The INFN Genoa detector is a resonant antenna consisting of two coupled spherical superconducting harmonic oscillators a few centimeters in diameter. The oscillators are designed to have (when uncoupled) almost equal resonant frequencies. The system is currently expected to have a sensitivity to periodic spacetime strains of , with an expectation to reach a sensitivity of . The Chongqing University detector is planned to detect relic high-frequency gravitational waves with the predicted typical parameters ~1011 Hz (100 GHz) and h ~10−30 to 10−32. A more sensitive class of detector uses laser interferometry to measure gravitational-wave induced motion between separated 'free' masses. This allows the masses to be separated by large distances (increasing the signal size); a further advantage is that it is sensitive to a wide range of frequencies (not just those near a resonance as is the case for Weber bars). Ground-based interferometers are now operational. Currently, the most sensitive is LIGO — the Laser Interferometer Gravitational Wave Observatory. LIGO has three detectors: one in Livingston, Louisiana, one at the Hanford site in Richland, Washington and a third (formerly installed as a second detector at Hanford) that is planned to be moved to India. Each observatory has two light storage arms that are 4 kilometers in length. These are at 90 degree angles to each other, with the light passing through 1 m diameter vacuum tubes running the entire 4 kilometers. A passing gravitational wave will slightly stretch one arm as it shortens the other. This is precisely the motion to which an interferometer is most sensitive. Even with such long arms, the strongest gravitational waves will only change the distance between the ends of the arms by at most roughly 10−18 meters. LIGO should be able to detect gravitational waves as small as . Upgrades to LIGO and other detectors such as Virgo, GEO 600, and TAMA 300 should increase the sensitivity still further; the next generation of instruments (Advanced LIGO and Advanced Virgo) will be more than ten times more sensitive. Another highly sensitive interferometer, KAGRA, is under construction in the Kamiokande mine in Japan. A key point is that a tenfold increase in sensitivity (radius of 'reach') increases the volume of space accessible to the instrument by one thousand times. This increases the rate at which detectable signals might be seen from one per tens of years of observation, to tens per year. Pulsars are rapidly rotating stars. A pulsar emits beams of radio waves that, like lighthouse beams, sweep through the sky as the pulsar rotates. The signal from a pulsar can be detected by radio telescopes as a series of regularly spaced pulses, essentially like the ticks of a clock. Gravitational waves affect the time it takes the pulses to travel from the pulsar to a telescope on Earth. A pulsar timing array uses millisecond pulsars to seek out perturbations due to gravitational waves in measurements of pulse arrival times at a telescope, in other words, to look for deviations in the clock ticks. In particular, pulsar timing arrays can search for a distinct pattern of correlation and anti-correlation between the signals over an array of different pulsars (resulting in the name "pulsar timing array"). Although pulsar pulses travel through space for hundreds or thousands of years to reach us, pulsar timing arrays are sensitive to perturbations in their travel time of much less than a millionth of a second. Globally there are three active pulsar timing array projects. The North American Nanohertz Gravitational Wave Observatory uses data collected by the Arecibo Radio Telescope and Green Bank Telescope. The Parkes Pulsar Timing Array at the Parkes radio-telescope has been collecting data since March 2005. The European Pulsar Timing Array uses data from the four largest telescopes in Europe: the Lovell Telescope, the Westerbork Synthesis Radio Telescope, the Effelsberg Telescope and the Nancay Radio Telescope. (Upon completion the Sardinia Radio Telescope will be added to the EPTA also.) These three projects have begun collaborating under the title of the International Pulsar Timing Array project. On 11 February 2016, the LIGO collaboration announced the detection of gravitational waves, from a signal detected at 09:50:45 GMT on 14 September 2015 of two black holes with masses of 29 and 36 solar masses merging about 1.3 billion light years away. During the final fraction of a second of the merger, it released more than 50 times the power of all the stars in the observable universe combined. The signal increased in frequency from 35 to 250 Hz over 10 cycles (5 orbits) as it rose in strength for a period of 0.2 second. The mass of the new merged black hole was 62 solar masses. Energy equivalent to three solar masses was emitted as gravitational waves. The signal was seen by both LIGO detectors in Livingston and Hanford, with a time difference of 7 milliseconds due to the angle between the two detectors and the source. The signal came from the Southern Celestial Hemisphere, in the rough direction of (but much further away than) the Magellanic Clouds. The confidence level of this being an observation of gravitational waves was 99.99994%. On 15 June 2016, the LIGO group announced the detection of a second set of gravitational waves, which was observed at 03:38:53 GMT on 26 December 2015. The signal was seen by the Hanford LIGO detector 1.1 milliseconds after the Livingston detector. The signal rose from 35 to 450 Hz over the course of 55 cycles (27 orbits) during the period of observation of about a second. Analysis of the signal indicates that this event represented the merger of two black holes about 1.4 billion light years distant, with masses of about 14.2 and 7.5 solar masses, yielding a combined black hole of approximately of 20.8 solar masses, with one solar mass radiated away. The estimated spin parameter (ratio of angular momentum to theoretical limit) of the final black hole is 0.74, slightly higher than for the first detection (0.67); it was also found that at least one of the premerger black holes had a spin of greater than 0.2. This measurement provided additional support for general relativity. Gravitational waves are presently understood to be described by Albert Einstein's theory of general relativity. In the simplest cases, and certain less-dynamic situations, the energy implications of gravitational waves can be deduced from other conservation laws such as those governing conservation of energy or conservation of momentum. Beyond these simple cases, Einstein's equations show how the curvature of spacetime can be expressed mathematically using the metric tensor — denoted . The metric holds information regarding how distances are measured in the space under consideration. Because the propagation of gravitational waves through space and time change distances, we will need to use this to find the solution to the wave equation. where G is the gravitational constant, c is the speed of light in vacuum and where the negative sign means that power is leaving the system, rather than entering. For a system like the Sun and Earth, is about 1.5×1011 m and and are about 2×1030 and 6×1024 kg respectively. In this case, the power leaving the Earth, Sun system is about 200 watts. This is truly tiny compared to the total electromagnetic radiation given off by the Sun (roughly 3.86×1026 watts, or almost 400 million, million, million, million watts). In this case, the minimum distance to find waves is R ≈ 1/4π light-year, so typical amplitudes will be h ≈ 10−25. That is, a ring of particles would stretch or squeeze by just one part in 1025. This is well under the detectability limit of all conceivable detectors. where is Newton's gravitational constant, and is the speed of light. We assume geometrized units, so . This flat-space metric has no physical significance; it is a purely mathematical device necessary for the analysis. Tensor indices are raised and lowered using this "flat-space metric". where represents the flat-space d'Alembertian operator, and represents the stress–energy tensor plus quadratic terms involving . This is just a wave equation for the field with a source, despite the fact that the source involves terms quadratic in the field itself. That is, it can be shown that solutions to this equation are waves traveling with velocity 1 in these coordinates. where we now see the origin of the two polarizations. In the linear case, , the density of mass-energy. where . Plugging in the known values of , we obtain the expressions given above for the radiation from a simple binary. An episode of the Russian science-fiction novel Space Apprentice by Arkady and Boris Strugatsky shows the experiment monitoring the propagation of gravitational waves at the expense of annihilating a chunk of asteroid 15 Eunomia the size of Everest. In the children's book Marie wants to be an Astronaut colliding black holes are featured. ↑ (PDF) Membres de l'Académie des sciences depuis sa création : Henri Poincare. Sur la dynamique de l' electron. Note de H. Poincaré. C.R. T.140 (1905) 1504-1508. ↑ Finley, Dave. "Einstein's gravity theory passes toughest test yet: Bizarre binary star system pushes study of relativity to new limits.". Phys.Org. 1 2 3 Castelvecchi, Davide; Witze, Witze (February 11, 2016). "Einstein's gravitational waves found at last". Nature News. doi:10.1038/nature.2016.19361. Retrieved 2016-02-11. 1 2 Overbye, Dennis (June 15, 2016). "Scientists Hear a Second Chirp From Colliding Black Holes". The New York Times. Retrieved June 15, 2016. 1 2 3 LIGO Scientific Collaboration and Virgo Collaboration; Abbott, B. P.; Abbott, R.; Abbott, T. D.; Abernathy, M. R.; Acernese, F.; Ackley, K.; Adams, C.; Adams, T. (2016-06-15). "GW151226: Observation of Gravitational Waves from a 22-Solar-Mass Binary Black Hole Coalescence". Physical Review Letters. 116 (24): 241103. Bibcode:2016PhRvL.116x1103A. doi:10.1103/PhysRevLett.116.241103. PMID 27367379. 1 2 Commissariat, T. (15 June 2016). 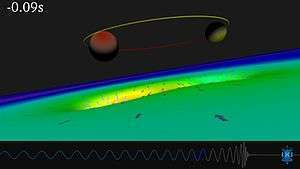 "LIGO detects second black-hole merger". physicsworld.com. Institute of Physics. Retrieved 15 June 2016. ↑ LIGO Scientific Collaboration; Virgo Collaboration (2012). "Search for Gravitational Waves from Low Mass Compact Binary Coalescence in LIGO's Sixth Science Run and Virgo's Science Runs 2 and 3". Physical Review D. 85 (8): 082002. arXiv:1111.7314 . Bibcode:2012PhRvD..85h2002A. doi:10.1103/PhysRevD.85.082002. ↑ Krauss, LM; Dodelson, S; Meyer, S (2010). "Primordial Gravitational Waves and Cosmology". Science. 328 (5981): 989–992. arXiv:1004.2504 . Bibcode:2010Sci...328..989K. doi:10.1126/science.1179541. PMID 20489015. 1 2 Hawking, S. W.; Israel, W. (1979). General Relativity: An Einstein Centenary Survey. Cambridge: Cambridge University Press. p. 98. ISBN 0-521-22285-0. 1 2 3 4 5 6 7 Cervantes-Cota, J.L. ; Galindo-Uribarri, S.; Smoot, G.F. (2016). 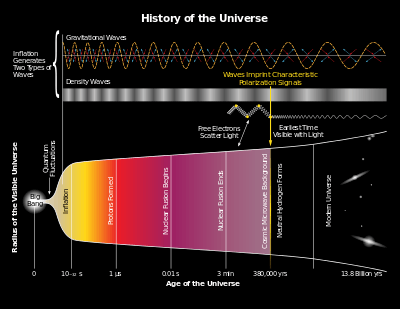 "A Brief History of Gravitational Waves". Universe. 2 (3): 22. doi:10.3390/universe2030022. ↑ "Gravitational Waves Discovered at Long Last | Quanta Magazine". www.quantamagazine.org. Retrieved 2016-02-12. ↑ "A Brief History of LIGO". ↑ "Facts". LIGO Lab | Caltech. Retrieved 2016-02-15. ↑ "Major Actions and Approvals at the October 13-14, 2004 Meeting of the National Science Board" (PDF). 1 2 Pretorius, Frans (2005). "Evolution of Binary Black-Hole Spacetimes". Physical Review Letters. 95 (12): 121101. arXiv:gr-qc/0507014 . Bibcode:2005PhRvL..95l1101P. doi:10.1103/PhysRevLett.95.121101. ISSN 0031-9007. PMID 16197061. 1 2 Campanelli, M.; Lousto, C. O.; Marronetti, P.; Zlochower, Y. (2006). "Accurate Evolutions of Orbiting Black-Hole Binaries without Excision". Physical Review Letters. 96 (11): 111101. arXiv:gr-qc/0511048 . Bibcode:2006PhRvL..96k1101C. doi:10.1103/PhysRevLett.96.111101. ISSN 0031-9007. PMID 16605808. 1 2 Baker, John G.; Centrella, Joan; Choi, Dae-Il; Koppitz, Michael; van Meter, James (2006). "Gravitational-Wave Extraction from an Inspiraling Configuration of Merging Black Holes". Physical Review Letters. 96 (11): 111102. arXiv:gr-qc/0511103 . Bibcode:2006PhRvL..96k1102B. doi:10.1103/PhysRevLett.96.111102. ISSN 0031-9007. PMID 16605809. ↑ "LIGO detects first ever gravitational waves – from two merging black holes - physicsworld.com". physicsworld.com. Retrieved 2016-02-12. ↑ Chu, J. (15 June 2016). "For second time, LIGO detects gravitational waves". MIT News. Massachusetts Institute of Technology. Retrieved 15 June 2016. ↑ Landau, L. D.; Lifshitz, E. M. (1975). The Classical Theory of Fields (Fourth Revised English ed.). Pergamon Press. pp. 356–357. ISBN 0-08-025072-6. ↑ Merritt, D.; et al. (May 2004). "Consequences of Gravitational Wave Recoil". The Astrophysical Journal Letters. 607 (1): L9–L12. arXiv:astro-ph/0402057 . Bibcode:2004ApJ...607L...9M. doi:10.1086/421551. ↑ Merritt, D.; Schnittman, J. D.; Komossa, S. (2009). "Hypercompact Stellar Systems Around Recoiling Supermassive Black Holes". The Astrophysical Journal. 699 (2): 1690–1710. arXiv:0809.5046 . Bibcode:2009ApJ...699.1690M. doi:10.1088/0004-637X/699/2/1690. ↑ L. P. Grishchuk (1976), "Primordial Gravitons and the Possibility of Their Observation", Sov. Phys. JETP Lett. 23, p. 293. ↑ "1974: the discovery of the first binary pulsar". arXiv:1411.3930 . doi:10.1088/0264-9381/32/12/124009. ↑ Thorne, Kip S. (1995). "Gravitational Waves". arXiv:gr-qc/9506086 . Bibcode:1995pnac.conf..160T. ↑ David G. Blair (Ed.) (1991). The detection of gravitational waves. Cambridge University Press. ↑ For a review of early experiments using Weber bars, see Levine, J. (April 2004). "Early Gravity-Wave Detection Experiments, 1960–1975". Physics in Perspective (Birkhäuser Basel). 6 (1): 42–75. Bibcode:2004PhP.....6...42L. doi:10.1007/s00016-003-0179-6. ↑ de Waard, Arlette; Luciano Gottardi; Giorgio Frossati (July 2000). Spherical Gravitational Wave Detectors: cooling and quality factor of a small CuAl6% sphere (PDF). Marcel Grossmann meeting on General Relativity. Rome, Italy: World Scientific Publishing Co. Pte. Ltd. (published December 2002). pp. 1899–1901. Bibcode:2002nmgm.meet.1899D. doi:10.1142/9789812777386_0420. ISBN 9789812777386. ↑ LIGO Scientific Collaboration; Virgo Collaboration (2010). "Predictions for the rates of compact binary coalescences observable by ground-based gravitational-wave detectors". Classical and Quantum Gravity. 27 (17): 17300. arXiv:1003.2480 . Bibcode:2010CQGra..27q3001A. doi:10.1088/0264-9381/27/17/173001. 1 2 Thorne, Kip (April 1980). "Multipole expansions of gravitational radiation". Reviews of Modern Physics. 52 (2): 299–339. Bibcode:1980RvMP...52..299T. doi:10.1103/RevModPhys.52.299. ↑ C. W. Misner; K. S. Thorne; J. A. Wheeler (1973). Gravitation. W. H. Freeman and Co.